Napoleon Bonaparte was born the 15th of August, 1769 on Corsica, just three months after the island had been defeated by the French. He would spend his childhood hating France, the nation he would one day rule. "I was born when [Corsica] was perishing. Thirty thousand Frenchmen spewed on to our shores, drowning the throne of liberty in waves of blood... The cries of the dying, the groans of the oppressed and tears of despair surrounded my cradle from the hour of my birth." After the French victory, many Corsican rebels fled to the mountains, where they continued to fight on. But Napoleons father Carlo, a twenty-three year-old university student, readily submitted to French rule. Soon he was wearing powdered wigs, embroidered waistcoats, and silver buckled shoes. The Bonapartes were Corsican aristocrats, but they were not rich. With eight children, they struggled just to get by on an island that had been impoverished for centuries. 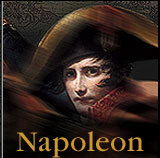 Napoleon never forgave his father for betraying his Corsican heritage. He would later say harshly that Carlo was rather "too fond of pleasure." His mother, Letizia, was a hard, austere woman, toughened by war, who punished her children to teach them sacrifice and discipline. "She sometimes made me go to bed without supper, as if there were nothing to eat in the house. One had to learn to suffer and not let others see it." As a representative of the Corsican parliament, Carlo travelled to Versailles. There, he saw the splendor of the French court in all its majesty, and he worked to secure Napoleon a scholarship to Brienne, a private academy in France. Napoleon set foot in France for the first time in the winter of 1778, a thin, sallow nine year-old, accustomed to the warmth of the Mediterranean, suddenly alone on the windswept plains of northern France. He could hardly speak French. JOURQUIN: He thinks of himself as a Corsican. He is surrounded by students who are the children of French aristocrats. And they have nothing in common with this little foreigner. And since he is quite proud, he becomes a loner. liberating Corsica. But he did something quite exceptional. He conquered his conquerors. He got the better of the French. At the age of fifteen Napoleon was promoted to the Royal Military Academy in Paris. At sixteen, he began his apprenticeship as a lowly second lieutenant, training with the best artillery unit in the French army. His ambitions soared far beyond a military career, but in French society power and achievement was reserved for the nobility  not for an unsophisticated Corsican soldier. "Always alone among men, I come home to dream by myself and to give myself over to all the forces of my melancholy," Napoleon wrote. "My thoughts dwell on death... What fury drives me to wish for my own destruction? No doubt because I see no place for myself in this world." Then the French Revolution changed everything. Bonaparte was twenty-three when he took leave of absence from the French army and returned to Corsica an idealistic revolutionary. The French Republic had made Corsica a part of France, and given Corsicans all the rights and liberties of French citizens. 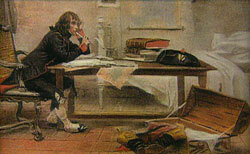 Bonaparte, a lieutenant in the islands National Guard, threw himself into Corsican politics. Bonaparte soon became the leader of a faction opposed to the islands governor Pasquale Paoli. The Corsican patriot thought Bonaparte too ambitious, too self-centered, too sympathetic to France. WOLOCH: Bonaparte and Paoli are on totally different wavelengths. Paoli retains the idea that Corsica should be independent. By this time Napoleon Bonaparte is perfectly comfortable with a Corsica that is part of revolutionary France. Clan rivalry ran deep on the island, intensifying the political struggle between the two men. Paolis partisans and Bonapartes were soon at war. In the end, Paoli proved too strong. Bonapartes home was sacked and he was forced to flee to the mountains. The Corsican Assembly declared Bonaparte and his entire family "traitors and enemies of the Fatherland, condemned to perpetual execration and infamy." Bonaparte no longer had the right to live in Corsica. He had been given a death sentence by his own people. On June 10, 1793 he set sail for France with his widowed mother, three brothers and three sisters  a refugee family carrying with them all they owned in the world. Twenty-four years old, he was banished from the land of his birth forever.